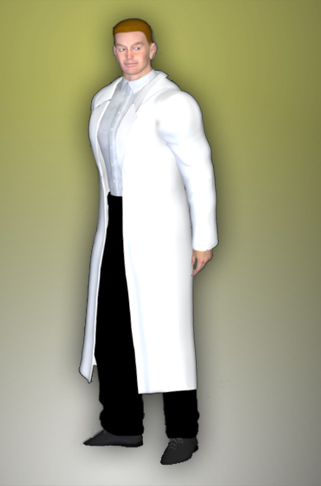 Mike Roland is an APEX Laboratories engineer and scientist under the employ of Max Indeks. He studied engineering at Metrobay University, where he met and became close friends with his future co-worker Jeremy Tezuka. The two were also classmates with Shelley Calvin, whom both of them harbored an interest in. Unlike Jeremy, who was an extremely hard worker, Mike was far more laid back and an out-going partier, yet his natural talents in engineering allowed him to coast through the curriculum with minimal effort. He was hired by APEX shortly after graduating. Mike’s life took a dramatic shift the day an APEX salvage crew recovered a damaged Mechana not far from the ruins of Dr. Twisted’s decimated hideout. Mechana was handed off to Mike and JT to be reprogrammed and repaired. She was reformatted to serve as a security droid for the labs against the inquisitive eyes and intervention of the Superheroine Squad. At the same time, Mike and JT were tasked with hacking in to the cyborg brain of Marcy Smith, now superheroine Silver Satin. While unable to control her complex neural network, he was able to toy with her mental signals, giving her headaches, blackouts, and mild amnesia, until eventually Marcy sought help from APEX. Rather than aid her, Max took full control over her and used her to resurrect the robot Sentius. Her task completed, Max tasked JT and Mike with erasing her memory and disposing of her, but the two lecherous men were too overcome with the prospect of controlling and using the attractive superheroine in whatever fiendish ways they could think of. Their mind controlled tryst with Marcy was interrupted by Shelley, who deactivated Marcy’s mind control. Needless to say, she was furious at the pair of guilty scientists and they hastily sent the security droids after her. When those proved ineffective, JT activated Mechana and sent her after Marcy. To his surprised, however, Marcy was able to break his control over Mechana, who returned the favor by knocking JT unconscious and chasing Mike away, allowing them to escape. With Silver Satin and Mechana gone, a furious Max demanded accountability, but Mike and JT passed the blame on to Shelley Calvin. Regardless of whether Max believed their cowardly lies, he decided Shelley should bear the brunt of the blame and she was used as a human guinea pig for the radiation reactor, turning her into the mutant monster Super Freak. Enjoying his unexpected promotion with Shelley out of the picture, Mike has continued to assist Max in his illegal science experiments. In particular, he is an ardent fan of the ladies and is a notorious skirt-chaser. He’s more than willing to bend the rules or even undermine his boss at the offer of more tail to chase, much to his co-worker JT’s frustration, and he holds great interesting in Max’s secretary petsGinger and Dani. He’s also not above calling in sick to goof off and play video games. It remains to be seen if his lackadaisical approach to work and life will ultimately bring his downfall, or under APEX employ result in further promotions and success.